People have had a strong influence on Somiedo’s landscape and they have worked the land in a sustainable way to obtain goods and services from natural resources. “Conserving nature or dying”, this was the question for Somiedo’s inhabitants for many generations. Local culture is linked to cow exploitation and pastures. Every little grass has been an economic input, even near the highest mountains, over 7,000 feet. This fact implies a wide net of little farming infrastructures, such as little cottages near the best pastures to maintain a good number of cow herds in summertime. Stones, wood and vegetables of each area were used to build those facilities, creating settlements named ‘braña’. As a result of this there are typical ‘vegetable roof’ buildings adapted to the particular condition of each site. Human movements from villages to brañas were an important fact. From Spring to Autumn young people ascended to the mountains every day to take care of their families herds, both in the late afternoon and in the morning. They stayed in the brañas during the night and that is the origin of a little infrastructure near the water courses to keep milk fresh called ‘ol.leras’. In other way, each braña was a space of vitality, where young people practised traditional games, played rudimentary music and popular dances, even in the hardest economic periods. This popular music, based on simple rhythms to dance, with improvised ironic verses full of jokes and funny rivalry between villages, was combined with other types such as vaqueiradas. The first rhymes aroused other more spontaneous verses accompanied by the rhythm of the spoons, a bottle or knocks on the table. Songs topics were linked to weddings, snow, bears, mythological beings, treasures, priests, the superb or better condition of each village and so on. Although in another way, the same histories appear in the ‘filandón’, late afternoon meeting at village’s houses where many people of different families share ideas and complete little works. That was and still is one of the moments that old people use to transmit their cultural knowledge, slowly and with the sympathy of young and children who enjoy tales and songs. The view of little fields with their limits drawn by strong stone walls and trees in the corners (to avoid the erosion), help us to understand Somiedo. Agriculture of subsistence was practiced long time ago, but the cow farms evolution has changed the landscape colour near the villages, from brown to green. Cows continue being much more than a part of an economic activity, and Somiedo’s farmers growth them with a special friendly attitude. Every cow is more than a farm animal and each one of them has its own name. Sometimes people do not eat meat from their cows, although they would sell them for that purpose. Dances, traditional sports and religious ceremonies absorb the activity of Somiedo in festivity journeys. The meeting point is usually the music made by tambourines and bagpipes, accordion or by a little band. Rural sport competitions concentrate the interest of men, who practise them in an asturian style. A good example could be the mountain bolos in which each player throws up the ball for three times from 20 yards trying to pull as much pins as possible. Afterword the player goes near the standing pins to complete his participation with a more accurate action. Both the ball and the pins are made of wood. A field, a road or a yard would be the scenery for the competition. 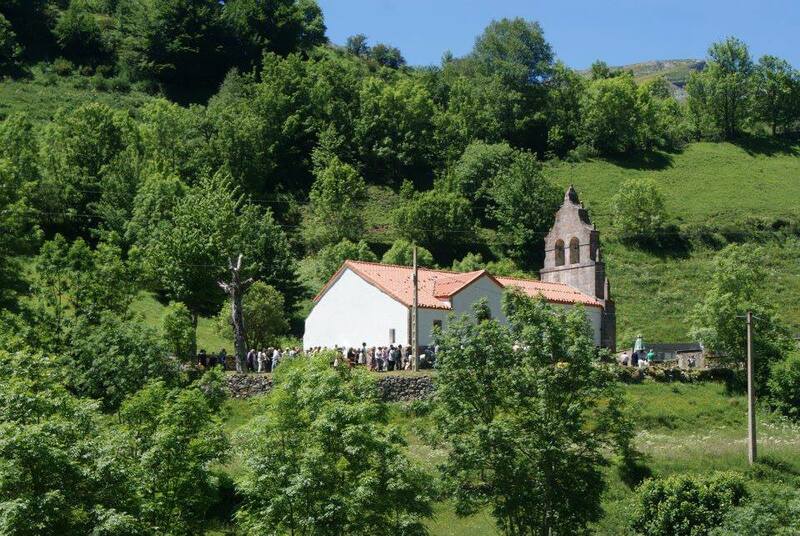 Few activities are developed around the religious services (the mass) such as the religious procession along the village to the church. A collection of sweet pieces of bread is transported, blessed and finally auctioned after the mass end. Into a society where life standard was low for generations these few special days was a lovely opportunity to everyone to taste different meals without as many restrictions as common days. The preparation of pig meat marks the arrival of snow. Every family makes their own products in an atmosphere full of mutual help and a few ritual proceedings. Common meals included simple ingredients such as bread, potatoes, rice, eggs, cabbage, chickpeas, lentils, cornmeal with a few pieces of sausage and bacon, butter, milk and coffee. The lamb (shepherd style recipe) and rice pudding are the special dishes for celebrations and frixuelos (pancakes) are celebrated by children usually. But there are a long variety of elaborated dishes such as ‘borrachinos’, they are made of bread, wine and sugar. And ‘chanfaina’ which is a savoury dish containing sheep entrails. Many thanks to Xose Alba, the author of this piece.